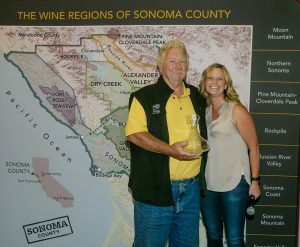 Richard Mounts, receiving the Viticulture Award of Excellence in 2016, alongside Karissa Kruse. Richard Mounts is a committed farmer and family man, being the second generation to run the family’s 140-acre estate in Dry Creek Valley. Mounts’ father, Jack, purchased the first 60 acres of land in 1946 to raise sheep and farm prunes—this is the land upon which Mounts was raised. He only veered away from the family farm to obtain his Bachelor of Science in soil science when he went to California Polytechnic State University. Upon returning to the farm, after receiving his degree and taking a road trip around South America, Mounts saw the writing on the wall in Sonoma County and knew he had to guide the family farm into grape production. With his father’s blessing, Mounts planted seven acres of Petite Sirah and ten acres of Zinfandel in 1967. In 1969, he began working on the family farm full-time, before eventually taking over the entire operation. Over time, the prune orchards were gradually replaced with vineyards and today, 90 acres of grapes are planted to ten varietals; half of those acres are planted to 38- to 45-year-old Zinfandel vines. Grapes are sold to both Sonoma and Napa counties, and now the third generation of Mounts has joined the family farming operation. As a committed farmer and family man, Mounts has been involved with Sonoma County Winegrowers for quite some time. He has served as a Board Member and is currently on the Executive Committee, as well as a former Commission Board Treasurer and member of the Marketing Committee. Mounts is also very active in the Sonoma County farming community, having served as President of the Sonoma County Farm Bureau in 1997-1998. 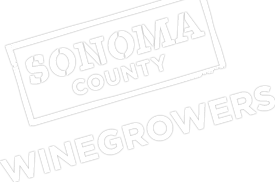 Sonoma County Winegrowers would like to thank Richard Mounts for his commitment and hard work with the organization over the years, and we are pleased that Mounts will be continuing his work with the commission on the Executive Committee. ← Summer 2017 Vine Times – Available Now!